“Congratulations on your purchase” appeared in my email inbox. I had just bought a rusty 1962 Toyopet Stout from the Chicago area. When the vehicle arrived here in New Mexico I noticed that the entire body was covered with very weathered, but still readable writing. The words were country names: Thailand, India, Turkey, Spain, Greece, and most of Western Europe. On the tailgate in barely visible letters it once read “Tokyo, Japan to Chicago, Illinois, USA”. When the seat in the cab was lifted, I found unused auto parts and several travel guides dated from the mid 60s and maps of Afghanistan and Pakistan. The truck was starting to tell more of its story. 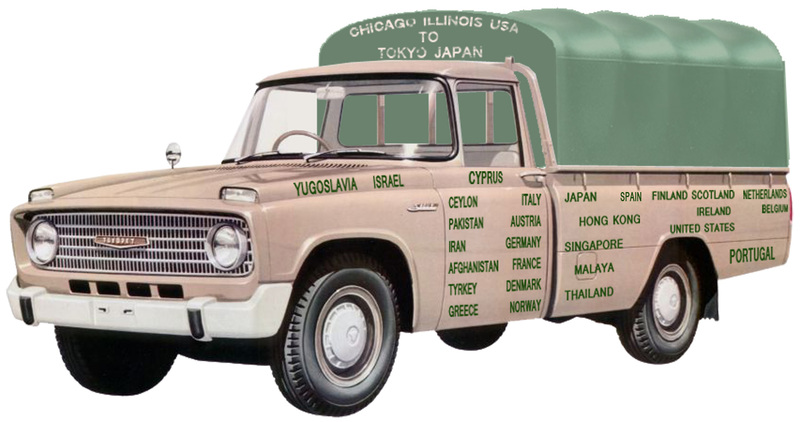 It seemed like someone drove the Toyopet from Tokyo all the way to Ireland and ended up in Chicago. But who were they and what was the reason behind such a journey? I scoured the internet and library archives for weeks, translated and searched in Japanese, but no results. A few months later another clue came to me in news stories about the Lee Roy Hartung collection. 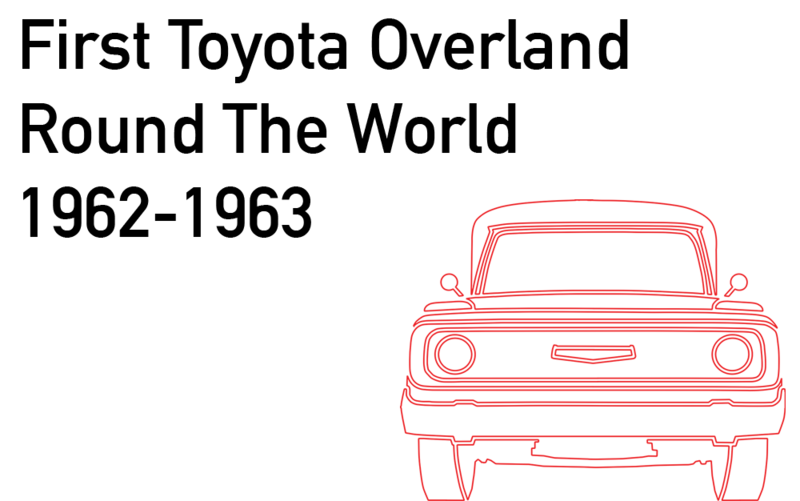 I discovered that the truck was a part of the famous Lee Roy Hartung car collection for over two decades. I wrote a letter to his life partner, Margie who called me a few days later. She was extremely surprised to receive my letter. She told me the story of a young couple, who in the late 1960s flew to Japan where they bought the Toyopet before starting off on a two year honeymoon to see the world. They finished in Chicago and settled in Morton Grove, Illinois. Many years later the owner gave the truck to Lee Roy Hartung in Glenview where it was displayed in his car collection outside. The truck stayed in his collection until his death where it was sold for scrap due to its rusty condition. Luckily, the scrap-metal dealer didn’t have the heart to destroy such a unique vehicle. While the information from Margie was helpful, it was incomplete. It has fueled my quest for more details about the honeymoon couple 45 years ago. I hope that somebody who knows about truck or the honeymoon couple would contact me. I am very motivated to restore the truck as much as possible and drive it back the same way it came to Chicago. Finding the original owners and hearing their story would be a great inspiration for my project.